Diwali, the festivals of light is one the biggest and most popular festival celebrated throughout the India. Make the dazzling occasion even more special by selecting trendy and stylish outfits for you and your loved one. Have you decided what you will wear on this Diwali? Are you looking for unique collections than your past suits? Here are some designer and eye-catching latest outfits ethnic for Diwali Celebrations that can make some heads turn. White is the colour of new beginning, simplicity, and inspiration. White cotton embroidery worked round neck & long sleeved is the best Bollywood Salwar Suit for the Diwali celebration especially for those who want simple and stylish attire. Long angrakha style is the latest in the trend. Round neck and the border with mirror work give the fascinating appearance. Have minimum makeup and accessories for the charming look. Multi slit in straight suit gives opening in the different side and provides the height illusion and smart look. Slit in straight pant is extraordinary. Dark blue with golden shade gives the luxurious appearance. Golden colour heavy embroidery work in Salwar gives a festive look. Golden accessories and high heels with this straight suit will make you awesome at the evening function. 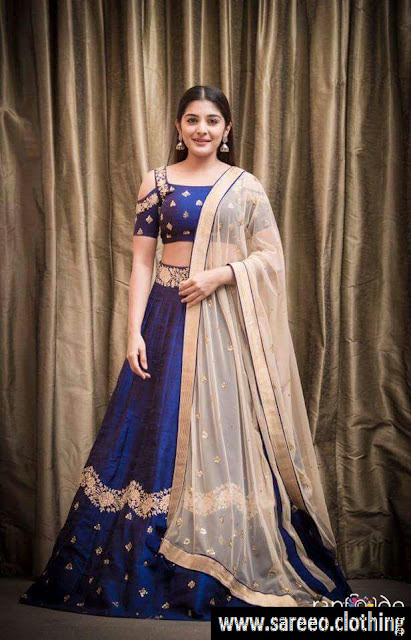 Designer lehengas are stylish outfits; wear fashioner lehenga choli with fantastic shades, style, and embellishment in gathering, Dhanteras Pooja or other functions and look refreshing. This multicolour lehenga is made up of phantom silk and gives the appearance like saree because of its unique style. Golden embroidery work in lehenga with multicolour blouse is an eye-popping combination. Anarkali suit is custom made clothing that looks awesome on cutting edge; it is one of the top offering attires in Indian shopping website. It is an apparently astounding choice with the traditional look. If you are looking for customary wear with some advancement, you should try it. Grey colour net Anarkali suit with heavy embroidery has coding embroidery work and stone. Full flare gives a really eye-catching look. Fair women have peachy-pink tones so they can use grey and golden shades to look radiant. Moss silk plain saree is one the incredible blend to look elegant, appealing and impeccable at once. Plain saree with sleeveless embroidery blouse gives an exquisite interest to your look. In the today’s era, blouse industry taking more consideration than saree. You can select any compliment embroidery worked blouse or matching with the shade of your saree. As the green is a colour of the peacock, it will be high contrast combination with blue colour. It should look something different than what’s expected and pleasant. Fashion and trend vary from time to time. Many elements influences to one style and design. In the world of fashion, women like to become more modern and stylish, but it depends on body figure, function etc. also. This digital printed long gown suits all the body type. This delightful royal blue long gown is made up of raw silk that is dull in shining, and digital floral print gives uniqueness to the gown. The gown will be suitable for celebration, festival, and party functions. 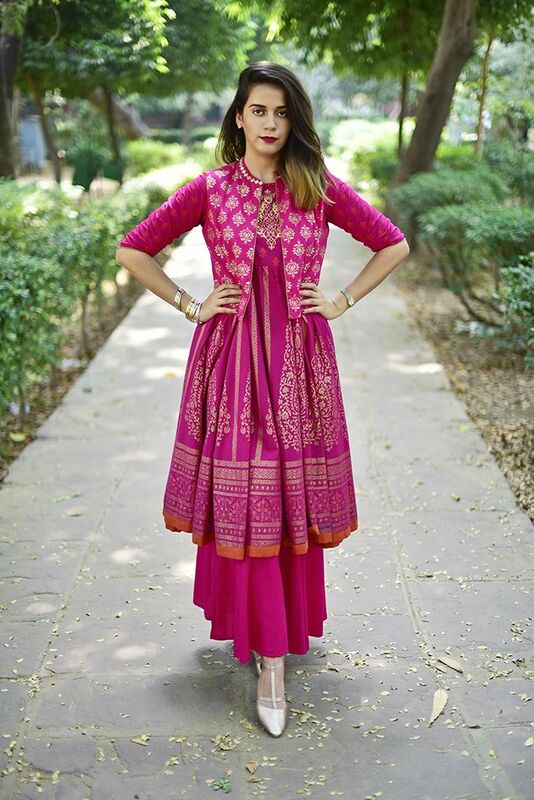 Tunic or Jacket style kurta with flared palazzo pant is an ongoing trend, and if you select the jacket style Anarkali, it will add the value to your look. For those who have thin legs, palazzo pant can make you fat in a styled. Shiny golden accessories give complete look and extraordinary. Jacket style Anarkali and Palazzo Pant both are the garment that drapes so it won’t show the skin. Messy hairstyle or slender bun with pumps heel are eye-catching combinations. Shopping for new style suits can be a mould minefield. Every month, new designs, style, colours, prints are coming. 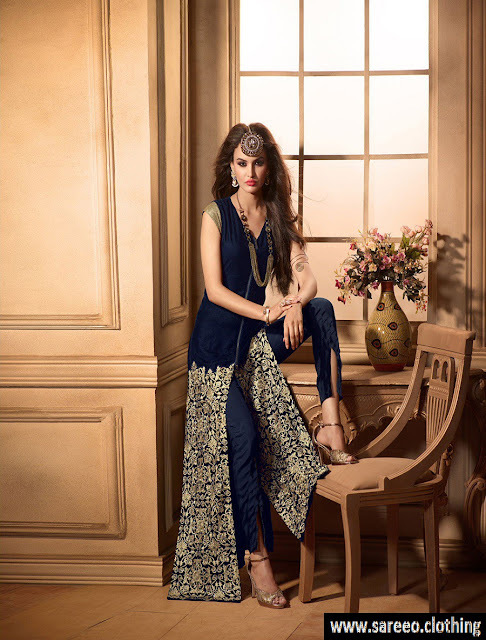 Up and Down style flared Salwar with straight pants looks sophisticated and comfortable. Green colour fancy style Georgette suit has hand embroidery work, golden embroidery border is available at a waistline and flare starts from it. Georgette material has little thicker ply and sheer appearance. The Golden border in salwar’s end line gives a substantial look that is suitable for celebration or gathering events. 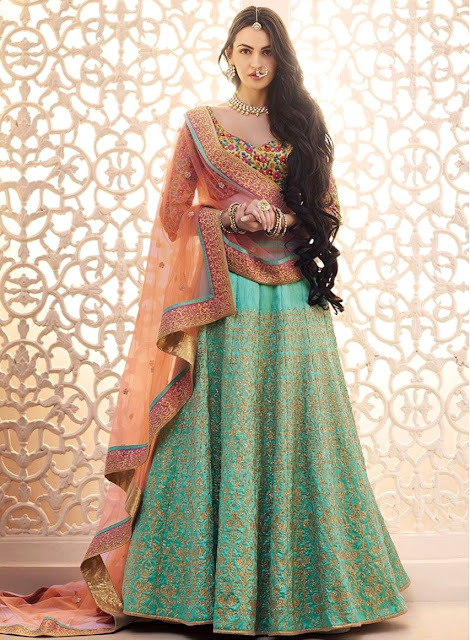 Lehenga could be free-flowing and shows a lot volume to the skirt. 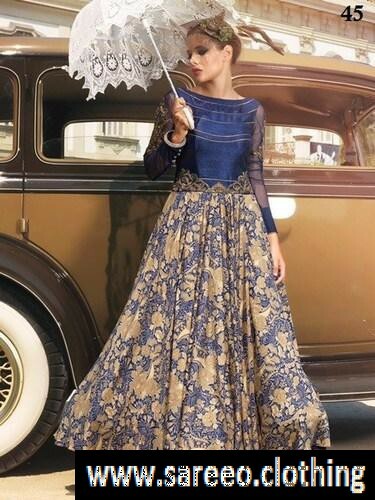 Blue colour taffeta silk lehenga consist blue circular lehenga, cream net broad bordered dupatta and off shoulder mega sleeve blouse with embroidery work that provides openness to the shoulder & gives a festive look. Blue with cream colour combination gives the royal appearance. Light accessories, messy hairstyle, and heels are the perfect for the wedding parties/gathering functions. Kurti is the best option who want a simple and stylish outfit that will give you a comfortable look also. This pink gown style kurta is made up of silk slub satin fabric that won’t go out of fashion. It’s having deep V neck, mega sleeve, and broad purple border at waistline, puffy style and floor length that gives height illusion appearance. Those are having slim figure can select this kurta for the Diwali function to look elegant. Diwali is just around the corner and Indian ethnic wear online shopping website brings the ample range of trending collections. 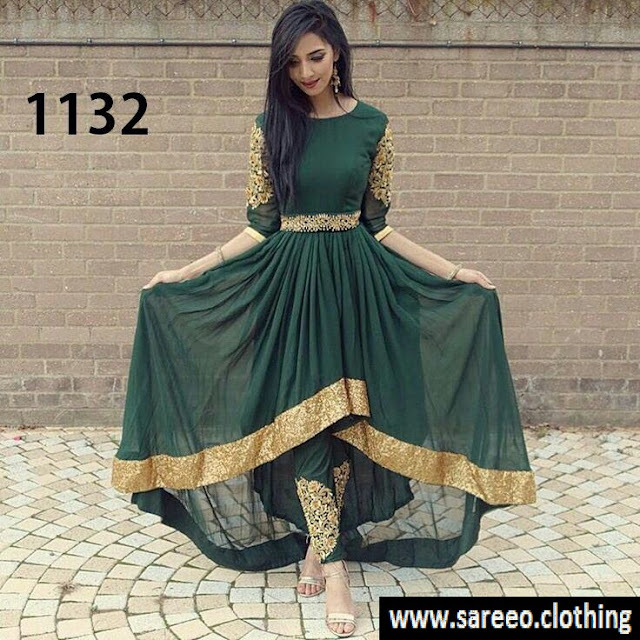 Shop @ https://www.sareeo.com/ to get classy and rich Diwali Collections and get the various style outfits. Shop now and get a benefit of the exciting deal with Worldwide Free Shipping.